SportsMatch mounts are Beeman Mounts and all of them provide a great scope base and rings. 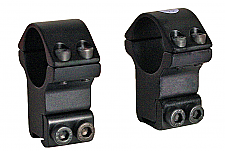 Sportsmatch base mounts are 11mm and fit most European pellet guns perfectly. They feature a stop pin to prevent the mount from sliding on the dovetail or scope rail but it can be pushed up out of the way if it isn't needed. These base mounts are made from a strong, heavy duty aluminum and have been used as Beemans standard mount for years. All in all, they are a great choice regardless of which air gun you choose or own.